I have had the awesome privilege and honor to live the greater part of my years (50+ of them!) as a Visitation Sister. While the essence of that life—a unique blend of Prayer and Community, as our founders describe it, “one of great humility toward God and gentleness toward the neighbor”—has remained a constant, new expressions have emerged throughout the 400 years this legacy has endured. 6:00 am We begin our day with an hour of personal prayer and meditation. 7:00 am We gather in our small chapel near the front door, where neighbors have access and are welcome to join us for our Morning Prayer of chanted psalms, readings, and handing over of our day. 8:00 am Our daily Eucharist is celebrated here and is followed by table fellowship, or if the priest does not come here, we go to one of the neighboring churches. It’s not at all unusual for someone to come to our door even as early as 7 am. A sign lets visitors know we are at prayer and they are welcome to ring the bell to join us. More often than not they do and as we offer our prayer and praise together their needs and concerns emerge. After prayer one or more sisters will be present to the visitor. Needs are met in a personal way and new relationships formed or existing ones strengthened. Some guests might be the couple in need of tokens to get to a morning court appearance or a meeting with a social worker. Some days a child who has missed a bus may ask for a ride to school. As former educators one of us would probably respond after making sure our young friend has at least a glass of juice and piece of toast to sustain him/her at work. Each of us has specific community work which is part of our day. It could be cooking the main meal, weeding the garden, organizing a field trip or getting materials ready for a group we will be welcoming to our home. These activities may be our plan on a given day but the reality of our life is that each day is a series of short visits with God who is present at the door or on the telephone or out on the street. We welcome Jesus in this way —in the disguise of our neighbors. Our Eucharistic meal, whether shared at 8:00 am, 11 am or 5 pm is immediately followed by a simple meal. Table fellowship with the priest presider and others present continues at the dining room table. Conversation is lively, informative, free-flowing and from the heart—civil discourse in a safe environment. Homeless friends and judges, single parents and struggling college students gather to share more than food—we share the very lives we have been given and we are all strengthened for the journey. Noon We pause for Midday Prayer, a time dedicated to local and global Peace. We are firm believers in thinking globally and acting locally. An afternoon may find a few sisters listening to a presentation about a new project starting up in North Minneapolis such as Women Achieving New Directions (for women in transition) or NETWORK (for people returning to life in the neighborhood after a period of treatment, rehab or incarceration). Some networking is less formal like hearing about plans for a community garden from a person on the next street. New homeowners on the block might pause from their yard work to introduce themselves and see who we are. As the conversation develops we share hopes for this place we know as sacred ground. 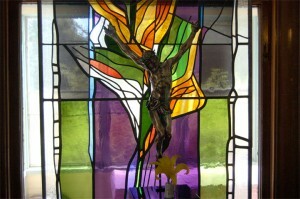 4:45 pm Evening Prayer followed by personal prayer time, evening meal and community recreation. Our evening meal includes sharing about our day. Who have we seen? What have we learned? We share plans, ideas and amusing stories. After dinner we work and play together. Table clean-up and dishes give way to a short game of Scrabble or Banana for some; a few hands of Solitaire or knitting for others or maybe all of us will attend a neighborhood event like the Ascension Peace Dinner, a block club meeting, a community talk at the St. Jane House, or the performance of someone we are encouraging to dream and develop skills at the Lundstrum School of Performing Arts. 8:15pm Night Prayer In this prayer, we hand over our neighborhood for a peaceful night, and make a commitment that if we awaken in the nighttime hours, we vigil with those who may be in chaos or pain. We use this in place of the Office of Readings in Common. While we frame our day with prayer and community, we find that a similar fidelity to the present moment and a flexibility that makes charity primary, have nuanced our life in new and generative ways. The Visitation is alive and well here, and our hearts sing Mary’s Magnificat of justice and praise in ever new and life-giving ways! We listen, pray and support. WE are changed in the process of being present to others; some people in the neighborhood are changed, too! May Jesus live in YOUR hearts, as together we celebrate 20 years and 400 years of the Gospel Story of VISITATION!